Today Amazon Web Services (AWS) announced the beta of Amazon FreeRTOS BLE, a feature that makes it possible for embedded developers to securely connect Amazon FreeRTOS devices that use Bluetooth Low Energy (BLE) to AWS IoT through Android or iOS devices. BLE support in Amazon FreeRTOS lets developers create new applications for devices that need lower power than any other forms of connectivity, including Wi-Fi. With BLE support in Amazon FreeRTOS, developers can use the standard Generic Access Profile (GAP) and Generic Attributes (GATT) profiles through a universal API layer to create BLE applications that are portable across any Amazon FreeRTOS-qualified device and use companion Android and iOS SDKs to integrate with AWS IoT functionality. According to the BLE specifications, GAP defines how BLE devices broadcast availability and communicate with each other. GATT describes how data is transferred once a connection is established. In this post, I provide a use case of a BLE device connecting to AWS IoT through an Android proxy. This allows the BLE device to use the same MQTT protocol, agnostic to the underlying communication carrier of either BLE or Wi-Fi. 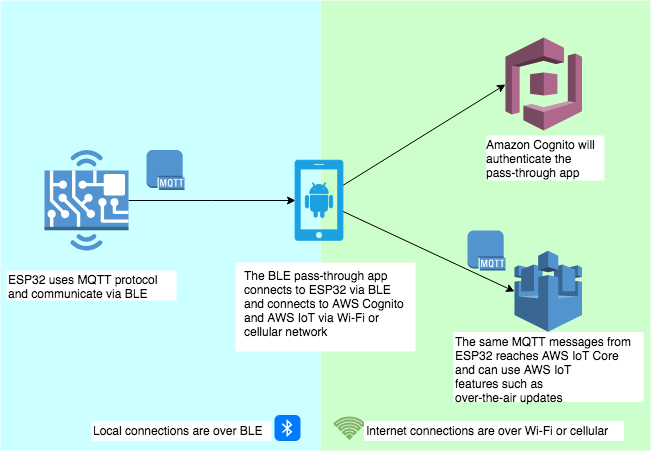 Because BLE offers lower power compared to Wi-Fi, devices can use the MQTT protocol to connect to AWS IoT services over BLE. This brings the best of low power and rich AWS IoT services, such as Amazon FreeRTOS over-the-air updates, to the devices in the field. At the start of the cycle after reset, ESP32 is in advertising mode and uses the GAP layer to broadcast data out to nearby BLE devices. One of the nearby BLE devices is an Android app which, when started, is in scanning mode. Advertising mode is a one-to-many transfer and offers no guarantees about data coherence. In the Android app it will scan for devices that match the name or address of the ESP32, and once the connect switch is toggled, both ESP32 and the Android app will enter into connected mode. BLE device will expose a custom GATT profile to allow the client to behave as a proxy and access AWS IoT services from the AWS cloud. During the authentication process the BLE device uses the AWS Cloud service certificate to securely wrap a challenge directed to the cloud service through the un-authenticated client. The challenge contains information about the BLE device and the client to be authenticated. If the challenge is satisfied, then the BLE device may grant the authenticated client proxy the ability to access AWS IoT services on behalf of the device. Data packets are delivered to the BLE device through a custom GATT profile. Sufficient disk space (~500Mb) for the Xtensa toolchain and Amazon FreeRTOS source code and examples. 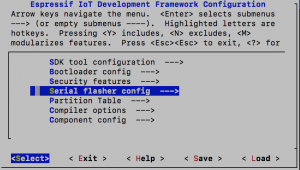 This post is written with the assumption that Xtensa toolchain, ESP-IDF, and Amazon FreeRTOS code is installed in the esp directory in the user’s home directory, ~/esp. You must add ~/esp/xtensa-esp32-elf/bin to your $PATH variable. An Android phone with Android 4.3 or later. Android Studio with Android 4.3 or later (API Level 18 or later) SDK installed. You can find information about the setup of the ESP32 hardware and build instructions in the Connect Microcontroller-Based Devices to the Cloud with Amazon FreeRTOS and Espressif ESP32 blog post written by my colleague, Anton Shmagin. First, I set up the AWS IoT thing and policy. Because I am using the MQTT proxy on my Android phone, which will be authenticated using Amazon Cognito, my ESP32 device does not need the AWS IoT certificates. Before you create the AWS IoT Policy, you need to know your AWS region and AWS account number. Sign in to the https://console.aws.amazon.com/iot/. From the upper-right corner of the AWS Management Console, choose My Account. Under Account Settings, make a note of the 12-digit account ID. Browse to the AWS IoT console. Browse to the AWS IoT Core console. From the left navigation pane, choose Settings. In Custom endpoint, make a note of the endpoint value. The endpoint should be something like “xxxxxxxxxxxxxx.iot.us-west-2.amazonaws.com”, in this case, the AWS region will be us-west-2. From the left navigation pane, choose Secure, choose Policies, and then choose Create. If you do not have any policy created in your account, you will see the message “You don’t have any policies yet” is displayed. Choose Create a policy. Enter a name for your policy (for example, esp32_mqtt_proxy_iot_policy). In the Add statements section, choose Advanced mode. Copy and paste the following JSON into the policy editor window. Replace the aws-account-id with your account ID (step 2). Replace aws-region with us-west-2 (step 4). From the left navigation pane, choose Manage, and then choose Thing. From the top-right corner, choose Create. If you do not have any IoT things registered in your account, the message “You don’t have any things yet” is displayed. Choose Register a thing. On the Creating AWS IoT things page, choose Create a single thing. On the Add your device to the thing registry page, enter a name for your thing (for example, esp32-ble). Only alphanumeric, hyphen (“-“) and underscored (“_”) are allowed. Choose Next. On the Add a certificate for your thing page, under Skip certificate and create thing, choose Create thing without certificate. 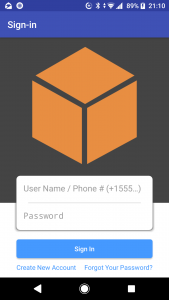 Because I am using the BLE proxy mobile app that uses an Amazon Cognito credential for authentication and authorization, no device certificate is required. Amazon Cognito is required for authentication of the MQTT proxy mobile app. An IAM policy is attached to the authenticated identity to allow the principal to attach the AWS IoT policy to the credential. Sign in to the Amazon Cognito console at https://console.aws.amazon.com/cognito/users/. From the right top navigation banner, choose Create a user pool. Enter the pool name (for example, esp32_mqtt_proxy_user_pool. In the App Clients, click Add app client, and then choose Add an app client. Enter a app client name (for example mqtt_app_client). Make sure the Generate client secret is selected. On the Review page of the user pool, choose Create pool. Make a note of the pool ID. In the navigation pane, choose App clients. Make a note of the app client ID and the app client secret. Enter a name for the identity pool (for example, mqtt_proxy_identity_pool). Enter the user pool ID and app client ID from the previous step. On the next page, choose Allow to create new roles for authenticated and unauthenticated identities. Attach an IAM policy to the authenticated identity so that the credential can attach the IoT policy to it. Choose the identity pool that you just created (in my example, mqtt_proxy_identity_pool). Make note of the IAM Role assigned to the Authenticated role (for example, Cognito_mqtt_proxy_identity_poolAuth_Role). Search for the role (in my example,Cognito_mqtt_proxy_identity_poolAuth_Role), and then choose it. Choose Add inline policy, and then choose JSON. For this post, I use the ESP32-DevKitC V4 developed by Espressif. Make sure that drivers for the board are installed. If you are installing the driver for Silicon Labs CP2104 on macOS High Sierra, you might need to restart installation after you whitelist the installation package in System Preferences > Security & Privacy. 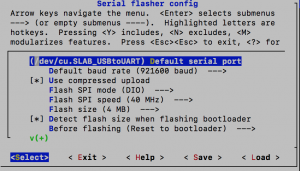 The UART to USB should appear as follows. Set your baud rate and serial port. The example Makefile for respective hardware is in amazon-freertos-library-share/demos/<manufacturer>/<hardware kit name>/make/. Open amazon-freertos-library-share/demos/espressif/esp32_devkitc_esp_wrover_kit/common/application_code/main.c. Make note of the mainBLE_DEVICE_NAME. You will need it for the Android app to match the BLE name (for example, ESP32). clientcredentialIOT_THING_NAME to the AWS IoT Thing you created earlier (in my example, esp32-ble). 0 49 [Btc_task] Started advertisement. Listening for a BLE Connection. For AWS_IOT_POLICY_NAME, use the name of the IoT Policy (in my example, esp32_mqtt_proxy_iot_policy). Open app/src/main/java/com/amazon/aws/freertosandroid/MainActivity.java and edit ESP_NAME. "Region": "<AWS region, e.g. us-east-2>"
Connect your Android phone to your computer. Goto Run → Run ‘app’. In Select Deployment Target, choose the phone in Connected Devices and choose OK. Choose Create New Account. Enter your email address and password to create an Amazon Cognito user. Amazon Cognito will send a confirmation code to your email address. On the next screen, enter the confirmation code sent to your email address. After a device that matches the ESP_ADDR or ESP_NAME is found, the Connect switch is enabled. After the Android app is connected to the ESP32, you should be able to see these messages in the ESP32 terminal. You can ignore the MQTT error for now, because you activate the MQTT proxy next. 4 16682 [MQTTEcho] MQTT echo attempting to connect to a1jgguqwhae8ke-ats.iot.us-east-2.amazonaws.com. 5 16682 [MQTTEcho] Sending command to MQTT task. 6 16683 [MQTT] Received message 10000 from queue. 9 16683 [MQTT] MQTT_Connect failed! Choose Discover to discover and register all GATT services from the esp32. Choose Set MTU to increase the default MTU from 20 to 500. Toggle the MQTT Proxy switch to enable the MQTT proxy. 65 4316 [MQTTEcho] MQTT echo attempting to connect to a1jgguqwhae8ke-ats.iot.us-east-2.amazonaws.com. 66 4316 [MQTTEcho] Sending command to MQTT task. 67 4316 [MQTT] Received message 70000 from queue. 68 4446 [Btc_task] MQTT Connect was accepted. Connection established. 69 4446 [Btc_task] Notifying task. 70 4446 [MQTTEcho] Command sent to MQTT task passed. 71 4446 [MQTTEcho] MQTT echo connected. 72 4446 [MQTTEcho] Sending command to MQTT task. 73 4446 [MQTT] Received message 80000 from queue. 74 4558 [Btc_task] MQTT Subscribe was accepted. Subscribed. 75 4558 [Btc_task] Notifying task. 76 4558 [MQTTEcho] Command sent to MQTT task passed. 78 4558 [MQTTEcho] Sending command to MQTT task. 79 4559 [MQTT] Received message 90000 from queue. 80 4582 [Btc_task] MQTT Publish was successful. 81 4582 [Btc_task] Notifying task. 82 4583 [MQTTEcho] Command sent to MQTT task passed. 84 4593 [Echoing] Sending command to MQTT task. 85 4593 [MQTT] Received message a0000 from queue. 86 4617 [Btc_task] MQTT Publish was successful. 87 4617 [Btc_task] Notifying task. 88 4617 [Echoing] Command sent to MQTT task passed. If you have Android Studio connected to your phone, you can filter the messages in the Logcat by choosing Show only selected application. 2018-11-09 11 (tel:2018110911):50:31.524 26628-29470/com.amazon.aws.freertosandroid I/AmazonFreeRTOSManager: Sending PUB ACK back to device. 2018-11-09 11 (tel:2018110911):50:31.634 26628-26643/com.amazon.aws.freertosandroid D/AmazonFreeRTOSManager: There's no ble command in the queue. In the navigation pane, choose Test. You should be able to see the MQTT messages in the AWS IoT console. Getting started with Amazon FreeRTOS BLE is easy. You can download source code from the Amazon FreeRTOS console and the SDK for either Android or iOS from GitHub. The download also contains a sample Android/iOS app that you can use to start building your BLE device. When the BLE device boots up, it enters the standard BLE pairing process for headless devices. Amazon FreeRTOS support for BLE is available for any of the qualified development boards, such as Espressif ESP32 used in this post. For more information about how to get started, see the Amazon FreeRTOS Developer Guide.